First let me start by stating I WON’T be making this again for a while. Then why post the recipe if I don’t plan to bake this again? Because it was so amazingly delicious I couldn’t stop eating it is the reason why! This recipe can be assembled at night, placed in the refrigerator, and baked for breakfast. Use frozen bread dough balls or whip up a batch of ARTISAN BREAD IN 5 MINUTES A DAY. YUM! In a medium skillet over medium heat scramble the sausage until mostly browned, then add the diced peppers and onions. Sautee for a couple of minutes or until onions begin to turn translucent. Set mixture aside. Generously grease a bundt pan. For a crispy tasty flavor go all out and use some bacon drippings. Then fill the bottom of the pan approximately 1/3-1/2 full of 1″ bread dough balls. I had a batch of the ARTISAN BREAD IN 5 MINUTES A DAY made and stored in the fridge. I used about 1/3 of the batch to make the bread dough balls. Place the cooked sausaage, peppers and onions on top of the bread dough. Add the shredded cheddar cheese and dot generously with butter. Cover pan with foil and place it in the refrigerator overnight. Remove the pan from refrigerator when ready to bake. Preheat oven to 425 degrees. Let pan set on counter top about 20-30 minutes, while oven preheats. Bake for 20 minutes, then uncover pan and bake another 10-15 minutes, or until bread is fully cooked in center of pan, and cheese is golden brown. Use a knife to go around the bread, and to help gently remove bread when it is cool enough to handle. 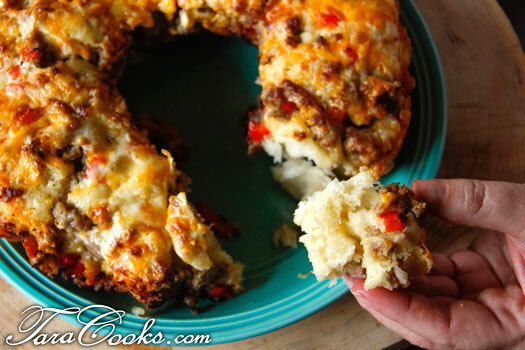 Place a pretty plate on top of bundt pan and flip all upside down to release breakfast bread. Serve while bread is still pretty warm. Going to try this one soon!